More than 15 years ago, I stood in the middle of the massive ruins of Circus Maximus, awed by the age of the stones, by the incontrovertible proof that people like me had lived and raced, cheered and entertained, and sometimes died there two thousand years ago. My semester abroad in Europe opened my eyes in many ways, but in particular I started to feel a connection with earlier, even ancient, generations. They seemed more real, more human, more three-dimensional than the shallow stereotypes I had gleaned from history textbooks. 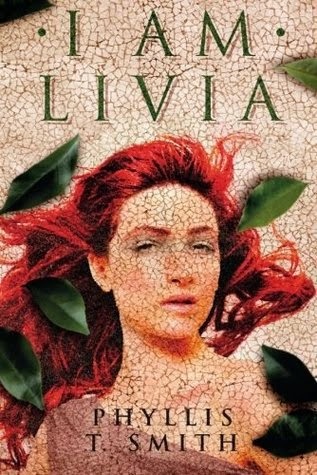 In I Am Livia, Phyllis T. Smith has created a compelling titular character based on the most sympathetic interpretation possible from the scant historical record. Not saying it's inaccurate, necessarily, but it's clear that she admires Livia and wants her readers to do the same, and in large part she succeeds. As she mentions in her author's note at the end, "Livia has gotten bad press. Rumor has a way even now of attaching to women who break the conventional mold, and it certainly did in ancient Rome." Livia is the eldest daughter of a well-to-do family of Roman citizens. She is married off at a young age to Tiberius Nero, one of her father's colleagues, in an effort to strengthen their bonds during a perilous period of political intrigue, widespread suspicion and conspiracies. Despite a strong grasp on politics, almost a prescience, her opinions and input are routinely ignored and she has a devastating glimpse into her future. "I saw my fate. I would not be fifteen forever, but I always would be a woman. I imagine spending all my years having my words discounted." I knew vaguely of the limitations on women during ancient Rome, but seeing the effects on Livia's life made them very real. For example, women had no hope of gaining custody of their children if they divorced. Children belonged to their father automatically, meaning that Livia had no choice but to leave her children behind when she left her first husband to marry Octavianus. Fortunately, they remained on good terms (likely because Tiberius Nero didn't want to irritate such a powerful man as his ex-wife's new husband) and she was able to still visit and spend a great deal of time with her children, but this would not have been the case for most women. Over and over again, the only way for Livia - and other women in the story - to affect real change on her environment is to influence the powerful men around her. It's that awful old saying in action: "the man may be the head of the family, but the woman is the neck and can move the head wherever she wants". Blech. As time goes on, however, Livia proves her worth to Octavianus and she begins to amass real power. In a brilliant move, she offers to supervise his mail and distribute it appropriately, delegating smaller tasks to others and bringing only the most important matters to him directly. This one "unofficial role of authority in his government" gives Livia the ability to streamline his daily tasks, help determine his priorities, and demonstrate her value. "Suppose the gods decided what I needed now was to marry an extraordinarily intelligent wife? I think they're fully capable of arranging that, don't you?" He spoke earnestly, not as if he meant to flatter me but almost as if her were talking to himself. If he had written me a dozen poems rhapsodizing about my eyes, my hair, and my dulcet voice, it would have meant far less to me. It is a joy to be appreciated for the thing you want to be appreciated for. To be appreciated as a woman, and also to be appreciated as a creature with a mind--what more could I have wanted? I found in Livia a woman who used her significant gifts and talents to the best advantage possible in a time when they easily could have gone unused and unrecognized. She suffered deprivations and enjoyed luxuries as her fortunes turned; she lost dear friends and faced down dangerous enemies. She exercised the power she had to protect her loved ones and for the good of Rome. Now that my sympathies for this remarkable woman have been awakened by this fictionalized account of her life, it's time to go read some non-fiction and learn more about her.